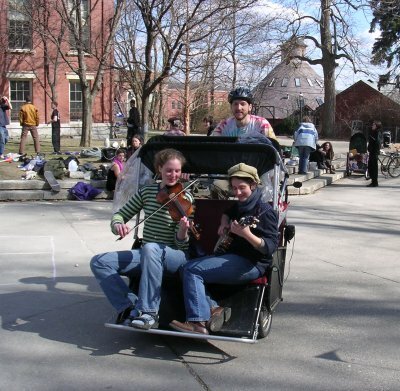 The pedicab comfortably fits two adults or three children. Due to Northampton's pedicab regulations, we can only provide service in Northampton for hire if it's entirely on private property. We can provide service for no charge (i.e., not for hire) as well, so if you'd like us to consider doing an event for free let us know! Unfortunately, as far as we know there are no fully licensed pedicab services in Northampton.